- "Bikes, Brawls and Burning Bars: The Making of Wild Hogs"
John Travolta, Tim Allen, Martin Lawrence and William H. Macy star in WILD HOGS, thhe hysterically funny comedy about four weekend-warrior friends who decide to rev up their ho-hum surburban lives with a cross-country motorcycle adventure. They don their leathers, fire up their hogs and throw caution and their mobile phones to the wind as they hit the open highway. But a lot can happen on the road to nowhere including a run-in with the bad-to-the-bone Del Fuegos, a real biker gang who don't take kindly to the wannabes. Let’s face it, city dwellers like you and I are a boring lot. Every day, we commute from home to work and from work to home. And when you reach middle age, the feeling gets worse and you yearn for something new or a breakthrough in your life. That notion perhaps leads to the development of “Wild Hogs”, one of this year’s surprise comedy hits in the States although critics worldwide feel otherwise. 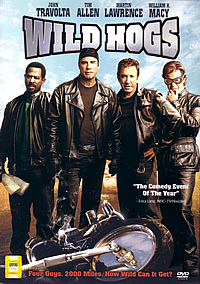 The premise of “Wild Hogs” involves four middle-age guys taking a bike trip to nowhere. John Travolta is Woody, a fast-tempered lawyer whose supermodel wife has left him. Tim Allen plays a small-town dentist whose life is utterly boring (and his family members also finds him boring). Martin Lawrence is a henpecked plumber-turned-writer and lastly William H. Macy is the typical single lonely computer geek. The four leads are all familiar faces to audience and they each have their fair share of funny bones (with the exception of Macy but surprisingly he does contribute a couple of laughs here). However, a good comedian needs a good solid script to work on. “Wild Hogs” at some point fails to deliver some of that aspect. One: The mystery of the missing punchline. A memorable scene which involves the guys discussing a bag of poop during a campfire. Everyone including the audience is equally enthusiastic about the bag of poop. But what happens to the “bag of poop” joke in the end? A seemingly unrelated fire incident kills it. Two: Too many caricature characters. There’s the menacing looking Ray Liotta who neither provide the laughs nor provide the threats. He’s not even this close to the “cartoonish villain” category. Joe Pesci was good in “Home Alone”. He was funny, menacing and threatening. Now that’s comedy. Ray Liotta obviously is in the wrong movie. Marisa Tomei looks like she’s in for the paycheck and catering, a throwaway love interest for Macy’s character. Not to mention, Tichina Arnold as Lawrence’s wife, whose sole purpose here is to be a human loudhailer. The only laugh-inducing role goes to John C. McGinley who hams it up as a gay cop. I don’t want to sound like I’m a homophobia but seeing McGinley trailing after the wild hogs is a hoot. It’s pathetic when a movie has to rely on gay jokes to sit through. Neither Travolta, Allen nor Lawrence delivers the lines to tickle you. There are the occasional chuckles and an unnecessary major explosion to jolt you. “Wild Hogs” serves to while away 99 minutes of your time over the weekend but not enough to chase away your middle-age blues. Nevertheless, if you are not expecting much, it might turn out to be an inspiring trip. Beats spending time with your mother-in-law. First up is the Audio Commentary with Director Walt Becker and Writer Brad Copeland, an informative track if you wish to know more behind-the-scenes anecdotes. These 2 are not engaging talkers but come to think of it, not everyone can be Anthony Robbins. "Bikes, Brawls and Burning Bars: The Making of Wild Hogs" is the usual making of featurette which covers everything under the sun. From the cast and crew interview to how the actors are taught to ride the Harleys. “How To Get Your Wife To Let You Buy A Motorcycle” is a silly three minutes featurette which featured the movie’s stunt coordinator dispensing advice on how to tell your wife biking-riding is safe. It’s meant to be tongue-in-cheek but it’s not. I can tell you straight away this is a much better ending. At least it’s a throwaway gag that works. Judge for yourself in “Freewheeling Alternate Ending”. “High-Octane Deleted Scenes”. Someone should tell the marketing guys it’s a sin to call them high-octane. About 2 minutes of “Outtakes” are included as well and a whole slew of Disney Trailers round up this DVD. What can I say? The visuals are top-notch. The colours are sharp and vibrant and the DD.5.1 soundtrack, which adds a sense of realism to the ambience sounds of motorcycles revving and rock music is impressive.